King Tut... Ramses... Nefertiti... Cleopatra. 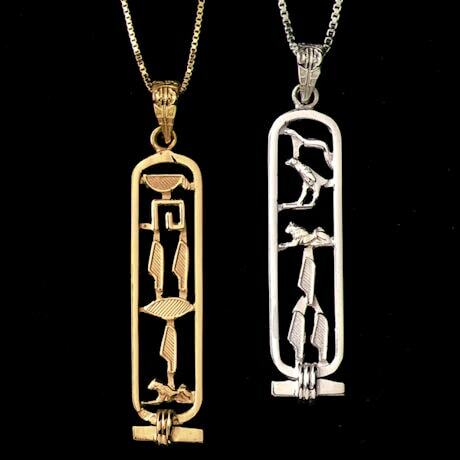 In ancient Egypt, each royal personage had a cartouche (pronounced "kar-toosh")--a unique hieroglyphic nameplate imbued with good fortune and the power to ward off evil spirits. 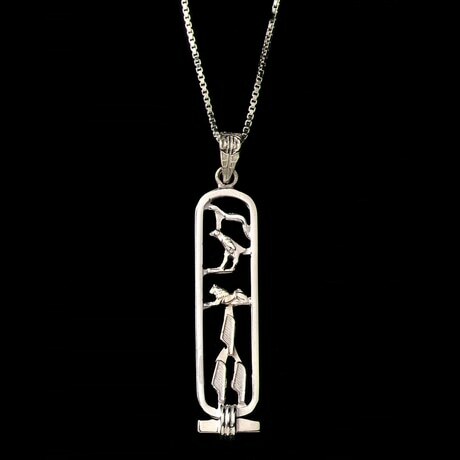 Our personalized cartouche pendant, handmade in a Cairo workshop, displays your name or initials (up to 8 letters) in sterling silver. Comes with a 20" sterling silver chain. Specify name or initials, up to 8 letters. Allow 3-4 weeks. No Rush or Express. Ships to 48 contiguous states only. *Ordering more than one personalized product? Add them to your shopping cart one at a time. For example, personalize an item for Sally, then add it to your cart. Return to the product page, personalize the item for John, then add it to your cart. Item can only be shipped within the Continental US.